where N is the number of pizza boxes that fit into a pizza bag and ‘/’ is the integer division operator that rounds towards zero. What this code does is add one to the result of the division, except for cases where the remainder of the division is zero. This code seems to work fine, but is it also efficient? At first glance, you might think that it is way less efficient than my official solution on the grounds that it uses the modulo operator and this requires yet another expensive integer division operation. Another downside is the fact that the code is not branch-free. Depending on the platform you are on, you might get a penalty if the branch is taken (“pipeline flush”). Yet, the likelihood that the branch is taken is actually low, as it happens only if size is not evenly divisible by MAX_PACKET_SIZE. By and large, I don’t like this approach. It requires more typing and is likely to have an efficiency issue. Depending on the value of size and N it is possible that their sum overflows the value range of their underlying types, which would result in a wrong value of pizza_bags. On the other hand, the original solution has one distinct advantage over the other two solutions: it handles the case where size (or the number of pizza boxes) is zero correctly. Only the original version will yield a result of zero in this case; the others will compute one, which is — of course — wrong. 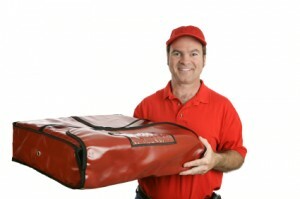 Any pizza delivery guy knows that if you have no pizzas you don’t need no bags at all!